Designed to fit a chest: 34” (37”, 40”, 43”, 46”, 49”) in circumference. Whether taking a walk on the beach or relaxing in the sand, this mesh top will keep you cool while looking hip this summer. 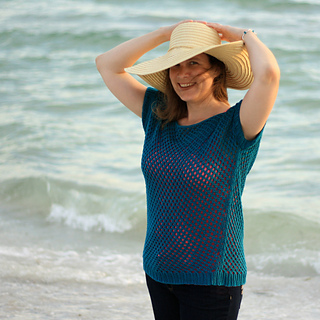 This dolman-style tee works up quickly due to the open mesh stitch and medium weight yarn. Increases from the waist to the bust build in lot of positive ease which is what becomes the sleeves - they are not knit separately. 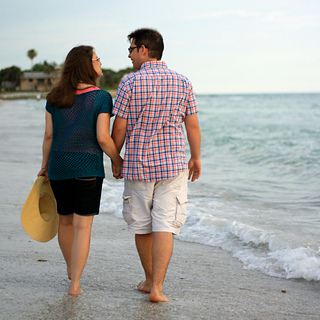 Adjustments in body length or neckline width are easy to make, and instructions are included in the pattern for this. Links to video tutorials for i-cord edging and how to finish an i-cord in the round are included in the pattern. Links to photo tutorials showing how to work M1R & M1L increases, as well as how to do a 3-needle bind-off are also included. A schematic with measurements is included to help you knit to the best fit possible. 590 (650, 705, 765, 830, 890) yds DK-weight yarn. The 100% cotton Ultra Pima listed above will result in a very drapey, unstructured top. The cotton / linen blend, Lino will result in a top with more structure and less drape. Please take a look at the beautiful projects made by testers who worked on this project! Many thanks to Ravelers: keljane, ekolatch, chau7, LTimms, Elin76, MargiBorck, & sw00d1e for making such lovely projects from this pattern!